What's on offer in and around Kuala Lumpur? Just about anything you're looking for. Plus a few great things thrown in for good measure. KL is a modern Asian cosmopolitan city on the fast track (excuse the pun) to the first world by way of its global ambitions, its high finance services and its famous classic-meets-contemporary architecture, with arguably the most impressive landmark award going to the nothing short of unique Petronas Twin Towers. That being said, in spite off all these modern trappings, you'll still be able to enjoy the best Asian street dishes, such as Laksa, Nasi Kandahar and finger-licking desserts like Chendol. 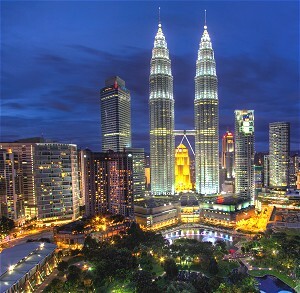 But KL also has some of the finest dining options in the region and also offers awesome fusion restaurants in the more exclusive locations. Best of all, you'll find that the majority of KL's hotels are of exceptional standard. If it's shopping you're after, then rest assured, KL is a veritable shopping paradise. It has numerous award-winning air conditioned shopping malls that offer all the major designer brands, as well as some of the up-and-coming local brands. And because the Malaysia currency, the Ringgit, has a very favorable exchange rate with most countries' currencies, you'll be pleasantly surprised at the very attractive pricing.